Cycling Speed: How Fast Can You Get? Given the right conditions, the boffins reckon a top athlete could pedal at an average speed of over 98 km per hour! How fast can you get? Physiological assessments of elite and sub-elite cyclists have focussed on aerobic capacity (VO2 max) as the main determinant of success. Relatively little attention has been paid to the anaerobic capabilities of competitive road cyclists, in spite of the convincing argument that can be made for the importance of anaerobic function. This becomes clear when you consider the role that explosive and sustained anaerobic energy production must play in attempts to break away from the pack, climb hills, and compete in sprints throughout and at the end of stages or races. These sections of competitive racing rely on the maximum rate of energy production by the individual cyclist, when there is little or no assistance from teammates in terms of avoiding wind resistance through stream-lining. In fact, riding in a pack has shown to reduce energy cost by as much as 39 percent at a given speed when compared to riding alone. So it follows that the most successful cyclists may not necessarily be those with the greatest aerobic capacity, especially in a close race, but may well be those with better anaerobic power and sprinting ability. Naturally, aerobic capacity is still extremely important but it may be anaerobic capability that decides the finishing order. To determine precisely which were the important differences between sub-elite cyclists in categories 2-4 in the United States (category 1 being elite), the research team of Tanaka et al at the University of Tennessee-Knoxville assessed both the maximal aerobic and anaerobic capabilities of 32 male and 6 female cyclists ('Aerobic and anaerobic power characteristics of competitive cyclists in the United States Cycling Federation', International Journal of Sports Medicine, 1993, vol. 14, no. 6, pp334-338). For the males, both aerobic and anaerobic performances seemed consistently higher as the standard became higher, suggesting a dual importance of both forms of energy production in achieving success. VO2max values ranged from 4.5-5 l.min-1, or expressed another way 63-70 ml.kg-1.min-1, which agreed with other previous research. Surprisingly, anaerobic performance was even higher than has been observed previously in power athletes such as gymnasts and wrestlers, although this may be partly a reflection of the cyclists' familiarity with the testing mode in all these studies - cycling itself. The results for the females could not be used to discriminate between standards because of the small sample size, although high values were still observed for both aerobic (3.4 l.min-1, 52 ml. kg-1.min-1) and anaerobic measures, displaying the same balanced physiological development. The researchers suggested that the years of strenuous interval training that the subjects had endured, especially the higher category competitors, had in fact served to increase both aerobic and anaerobic function - each of these has previously been shown to be affected positively during relatively short-term training programmes. Thus the conclusions from this study include a large emphasis being placed on the importance of interval training for competitive cyclists. A controversy still exists about how well each of the two energy systems can be developed simultan-eously, without a sacrifice having to be made in favor of one or the other. A unique cycling event is the 4000m individual pursuit, where a competitor from a stationary start must propel himself as fast as possible over the specified distance using a fixed gear. At international level, competition times are around 4.5 minutes, rising to 6 minutes and over at sub-elite levels. At elite level it can compare nicely with middle-distance running with its similar demands, and is generally accepted to have an anaerobic/anaerobic energy requirement of 80%/20%..
Craig et al. used this event to assess 18 experienced male cyclists ('Aerobic and anaerobic indices contributing to track endurance cycling performance', European Journal of Applied Physiology, 1993, vol. 67, pp150-158). The purpose of the study was to supply numerous measures of the cyclists' body types and physiological characteristics, and to use this data to determine mathematically the factors that most contribute to success.. Using relatively non-invasive methods, the two most important factors were found to be VO2 max and body fat. Even though, unlike running, there is no need to move it vertically against gravity, unnecessary body fat in cyclists still has a detrimental effect on three counts: an increased energy cost of acceleration at the start of the race, increased rolling resistance of the wheels on the floor, and increased frontal area of the cyclist - and thus increased air resistance. Of these, the increased air resistance is the most important - 5 kg of extra weight add about 4 seconds to race time due to this factor alone. For those with access to accurate equipment, if you can measure your VO2 max in l.min-1 and mass of fat in kg (can be calculated from body weight and percent fat), the equation for estimating 4000m individual pursuit time is: time in seconds = 441.2 + (4.316 x fat mass) - (25.94 x VO2 max). When the researchers in the Craig study then used all the data they obtained, irrespective of its complexity, they found that the most important predictors of success were VO2 max, LTPO (power output and lactate threshold) and MAOD (maximal accumulated oxygen deficit - a measure of anaerobic capacity). The equation (for those with access to sophisticated laboratory equipment) became: time = 462.9 - (0.366 x LTPO) - (0.306 x MAOD) - (0. 438 x VO2 max). This equation could account for about 75 percent of the variation in performance between individuals. What it showed was the importance of both aerobic and anaerobic capacity in producing peak performance over 4000m, with interval training once again the type of training to be concentrated on most. A reliance on purely aerobic energy production would need a VO2 max of around 90-100 ml.kg-1 .min-1 to compete at top level where average speeds of more than 50 km.h-1 are not unusual. Another way of looking at it would be to say that for a very well-trained male cyclist with a high VO2 max of 75 ml.kg-1.min-1 to compete, he would have to work at an intensity of at least 120% VO2 max, with the surplus requirement coming from anaerobic sources. Thus the 20 percent or so of total energy that must be produced anaerobically is essential to compete effectively and must be addressed in training. Capelli et al. carried out an interesting experiment ('Energy cost and efficiency of riding aerodynamic bicycles', European Journal of Applied Physiology, 1993, vol. 67, pp144-149) when they towed two cyclists in the fully dropped position on various designs of bike. The bikes had different combinations of aerodynamic and traditional frames, and lenticular and traditional wheels. Using exactly the same conditions for each trial, they found that lenticular wheels made little difference to air resistance, whereas an aerodynamic frame produced a significant reduction in air resistance. The combined effects were enough to give an improvement in performance of 3 percent, all else being equal. 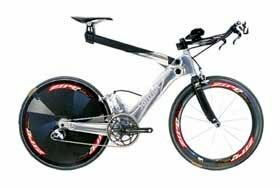 This compares well with average improvements in record times of a little more than 4 percent since the introduction of newly-designed frames and wheels. How Fast Can Cyclists Get? Over the past two or three years, a lot of media attention focussed on the various attempts to break the world 1-hour record. There has been intense competition between big cycling names as Tony Rominger, Miguel Indurain and the Brits, Obree and Boardman. All these athletes achieved average speeds of well over 50 km.h-1 when breaking the record, and the current record is more than 55 km.h-1. However, a research team from Australia (Olds et al. 'Modelling road-cycling performance', Journal of Applied Physiology, 1995, vol. 78, pp1596-1611) used data collected from 41 experienced cyclists to develop a complex mathematical model which can predict performances for a given athlete under given conditions of fitness, track, environment, etc. This allowed them to predict the best human performance possible if a perfect athlete were to attempt the record on a perfect track under perfect weather conditions. The profile of the hypothetical 'super-athlete' included the highest VO2 max they ever recorded of 92 ml.kg-1.min-1 and body mass = 67 kg from an Australian and world track endurance champion, as well as the ventilatory (anaerobic) threshold of 90% from an international road cyclist. The conditions were perfect - sea level (as are all valid record attempts), temperature = 20 deg C, relative humidity = 60%, wind speed = zero, best aerodynamic bicycle currently available, best riding surface, best riding position recorded for reduced air resistance (16% of body surface area presented forward for an international female cyclist), etc. The result was an average 1-hour speed of 56.9 km.h-1. If a rise in altitude is allowed (up to about 4000m) the performance actually improves, contrary to most other endurance events. This is because the reduction in available oxygen (and therefore the limit to energy production) is outweighed by the effect of reduced air pressure and therefore air resistance (and energy requirement). 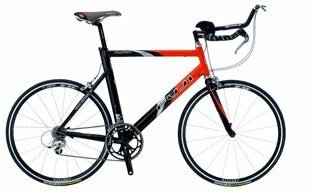 When compared to running, for example, cycling is affected positively in this way because of the great speeds that can be obtained and the high air resistance experienced. For A Runner, The Upright Position Creates A Great Amount Of Air Resistance. At 2230m above sea level Mexico City), the distance covered by the 'super-athlete' would be 58.7 km. At an altitude of 3500m, the distance covered would be 61.6 km. Finally, while considering the 'limits of the possible' in cycling, one can't pass without a mention of the theoretical situation reported by Capelli and di Prampero ('Effects of altitude on top speeds during 1 h unaccompanied cycling', European Journal of Applied Physiology, 1995, vol. 71, pp469-471). While wisely pointing out the dangers of using this type of mathematical model too confidently, the authors do postulate an interesting scenario. Imagine a hypothetical velodrome where the cyclist could breathe pure oxygen, thus allowing the air pressure to be reduced to 1/5 of its value at sea level with no detrimental effect on the oxygen content of the blood. Air resistance to the cyclist would thus be reduced dramatically. But Capelli and di Prampero go on to suggest that lowering the air pressure even moreso that the oxygen content of the blood is reduced compared to normal conditions at sea level would improve performance still further because of the relatively large reduction in air resistance. Under these conditions of a thin atmosphere of pure oxygen, the two calculate that Tony Rominger would achieve the respectable average speed of 98.14 km.h-1! One wonders how long it will be before something like this is attempted. As di Prampero et al. proposed back in 1979, the ultimate conditions would exist in a velodrome which was just a giant vacuum, with the cyclist pedalling away in a pressurized suit supplying him with oxygen!